WORK…One Word, Express In One Hundred Words In One Hundred Days. Work Is The Ability To Engage Mental, Physical And Spiritual Being For Profitable Living. Work Is Life; It Has The Capability To Revive. Work Is Creative, It Breeds Solution And Invention. Work Hard—Start Work Before Others, Work When Others Are Working And Work After Others Stop. 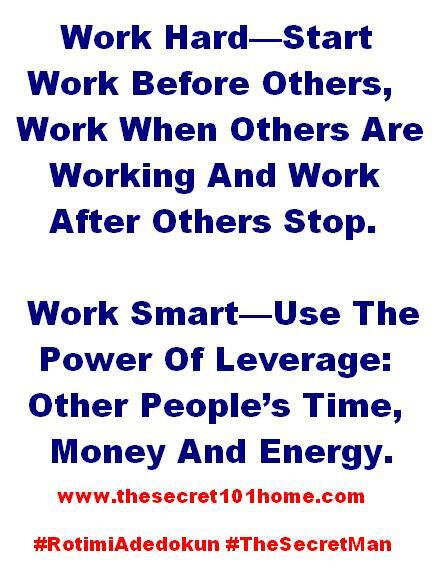 Work Smart—Use The Power Of Leverage: Other People’s Time, Money And Energy. The Formula Of Work Is Six Days Of Engagement One Day Of Rest. Work Show Your Depth Of Knowledge. Real Work Is Mind Your Own Business. This entry was posted in Creation and Wisdom, Life and Time Management, Self Development, The Peace, The Secret, Vitamin Of The Mind, You! and tagged Bishop David Oyedepo, Jim Rohn, John 5:17, Pastor E A Adeboye, Rotimi Adedokun, Work The Cure To Poverty. Bookmark the permalink.